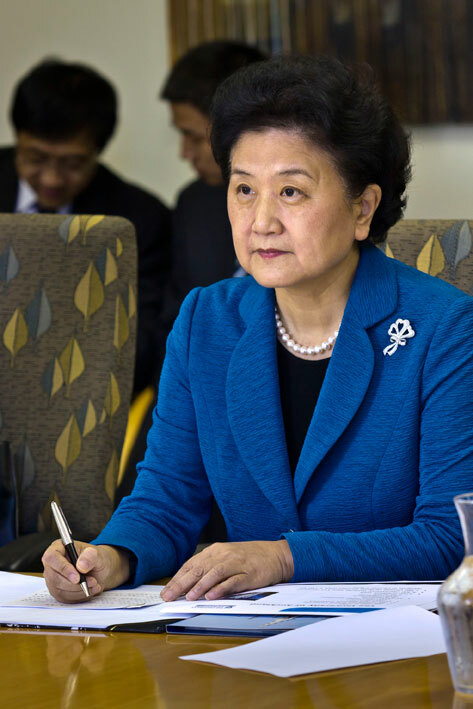 An official visit by State Councillor Liu Yandong, now a Vice-Premier of the People’s Republic of China, was the culmination of the Maurice Wilkins Centre’s work during 2012 to build strategic links between New Zealand and China in biomedical science. State Councillor Liu visited New Zealand to discuss cooperation between our two countries in science, innovation and education. On a flying trip she met with the Prime Minister, Mayor of Auckland and other dignitaries and also made time to visit The University of Auckland and hear a Maurice Wilkins Centre presentation. She was accompanied by other senior members of the Chinese government and diplomats. “The Chinese Embassy was aware of the reciprocal visits of Maurice Wilkins Centre scientists to China in April and of [Chinese] scientists to the Centre in August, [and their] in-depth discussions with respect to new drug developments,” explains Mr Xie Chengsuo, the Embassy’s First Secretary of Affairs of Science and Technology. With the second largest economy in the world, and a strategic approach to scientific and industrial development, China is making massive investments in science. Its Five Year Plan prioritises drug discovery, a high-technology area in which New Zealand, and the Maurice Wilkins Centre in particular, excels. The Centre also draws together much of New Zealand’s expertise in developing new treatments for non-communicable disease, one of the three priority areas in the China-New Zealand Five Year Roadmap for scientific cooperation. support aspects of drug discovery complementary to those available at the Centre.